Look for the Travelling Book Case outside Ipswich Central Library during the festival. It will be loaded up with books for people to swap, to help raise money for the Indigenous Literacy Foundation. Indigenous Literacy Day is September 2 and Andy Griffiths is their Ambassador so we thought we would spend the whole week of our festival swapping books and raising money for the Foundation while Andy is in town. 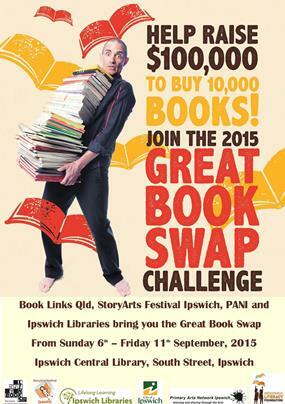 Bring along one of your favourite books, and for a gold coin donation you can swap it for someone else's. All the money raised is donated to the Indigenous Literacy Foundation.